An Englishman in Colombia: More Sanding! 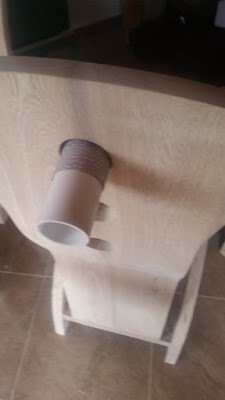 Today was the turn of some of the detail sanding, the holes in the back of the chairs, I either had to make a contoured sanding block, or use two fingers on a piece of sandpaper, which would not only be time consuming, but painful! 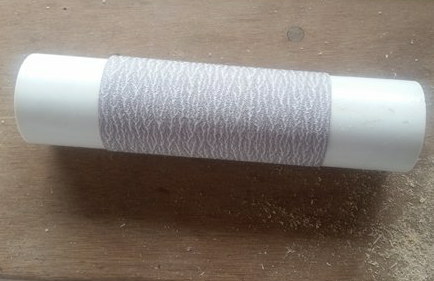 I took a piece of PVC pipe, slightly smaller than the hole, cut it to length using the tablesaw, then cut the tube down it's length, to give a split, which allowed me to tuck the ends of the sandpaper into the tube. 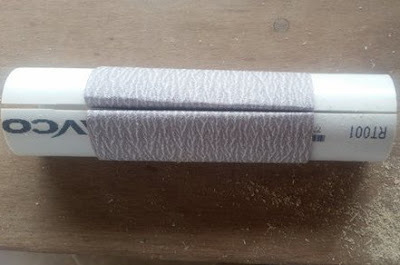 You can either leave it like this, or use some spray glue on the back of the sandpaper to keep it in place, likewise you could tape the tube so the split clamps the sandpaper. However I decided to give it a go as it was. Again there are two ways you can use this, the first is to hold one end, and push and pull through the hole, similar to drain cleaning!, the second is to put in through the hole, grab it with a hand on either side of the hole and turn it. The first is faster, but you have to be careful not to mis-shape the hole, the second is far better, but much slower, so I did a combination of both. 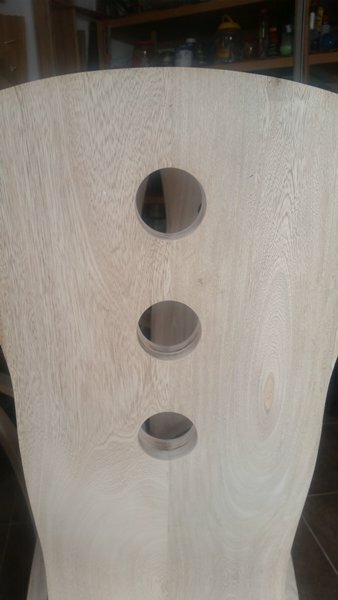 I had another problem to overcome, because the makers, paint their furniture rather than stain it, they are not too bothered about detail, they cut the holes with a hole saw, but because of the thickness, and to avoid splitting the wood, they cut from both sides, having drilled a guide hole, and meet in the middle, only on one of the holes they mis-aligned and there was a noticeable step between the two halves, also they obviously don't renew their cutter too often, because they had burnt the wood. To just stain this would show the burn marks, and they had to go. To resolve both problems, before using my sanding tube, I used my multi-tool (Dremel copy) with a course sanding drum on the end, removed the burns, and shaped the mis-aligned join. That done it was time for the boring stuff, sanding with the tube. 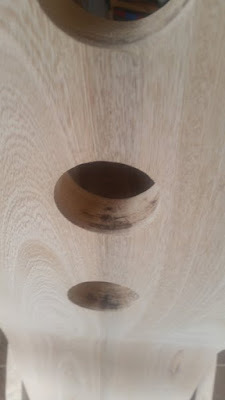 This is going to take some time, reducing the grit of the sandpaper as I go, so unless something else comes along, there probably wont be another post for a few days, I would only be repeating myself.